On the outside ice in the Italian Collalbo, the second day of the European Championship allround and sprint will take place on Saturday and in Dordrecht the European Championship short track will be held. Follow everything in our live blog. Itzhak de Laat is just short of a place in the A-final of the 500 meters. The Dutchman finishes third in his semi-final, less than a tenth of the number two Sébastien Lepape from France. For De Laat rest at the shortest distance the B-final. "There are always things that can be done better, but if you manage to win from Patrick Roest these days, you're doing very well", according to Kamer, who earlier today wrote 5,000 meters at the European Championship all-round, opposite the NOS . "Of course I would have liked to have taken the lead in the standings, but that was not in. It will be very exciting tomorrow, because it can go in all directions." Classification leader Suzanne Schulting is in the A-final of the 500 meters by a second place in her semifinals. Lara van Ruijven drives to victory in the other semi-final and also competes for the medals in about half an hour. Yara van Kerkhof ends after a difficult start as fifth and last in that race and is ready at her favorite distance. Leader Patrick Roest is not completely satisfied after the first day at the European Championships all-round. "There was more," says Roest in conversation with the NOS . "I had a few misses and I lost time, which is a point of attention, but otherwise I can be reasonably satisfied, it will be a very exciting day tomorrow." 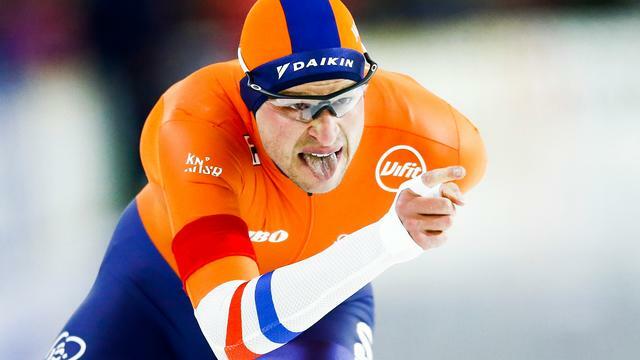 Sven Kramer writes the 5,000 meters at the European Championship allround in Collalbo. The Dutchman with 6.17,66 is half a second faster than Patrick Roest, who leads the classification. Kramer clocks the fastest time, but it is Roest who is still in the lead of the rankings. In the final stage, Douwe de Vries takes on Russian Sergey Trofimov. Itzhak de Laat qualifies as the only Dutch man for the semifinals of the 500 meters. De Laat ends second in his quarterfinals, after some contact with him and Daan Breeuwsma. The experienced Frisian loses speed, comes in third, and is ready at the shortest distance. The same applies to Dylan Hoogerwerf, who falls in his quarter final in the last corner. Halfway through the ride Kramer and Pedersen do not do much for each other. The Dutchman is a tenth faster than Roest. Danila Semerikov and Havard Bökko do not come to the time of Roest by far. In the next, penultimate stage, Sven Kramer takes on the Norwegian Sverre Lunde Pedersen. Roest puts his Polish opponent Artur Janicki almost on a lap and comes across the meet in a time of 6.18.21. This makes him the fastest by far. Back to that wonderful victory of @suzanschulting who falls in love with coach Otter. Barely recovered from her beautiful gold plaque on the 1,500 meters Suzanne Schulting places herself in Dordrecht on the 500 meters with great show of power for the semi-finals. Also Lara van Ruijven (first in her heat) and Yara van Kerkhof (second in her heat) are allowed to start over half an hour in the semi finals of the shortest distance. Patrick Roest starts his ride on the 5,000 meters. The Italian Andrea Giovannini is at the top for the time being. It is still waiting for Roest, Kramer and De Vries on these 5,000 meters. Daan Breeuwsma ends just behind the Russian Pavel Sitnikov as second in the B-final of the 1,500 meters. That is normally good for the ninth place in the final result. In Collalbo we continue with the last distance of this day. The men ride the 5,000 meters at the European Championships all-round. Douwe de Vries, Sven Kramer and Patrick Roest have yet to take action. Suzanne Schulting takes gold at 1,500 meters in Dordrecht! The Olympic champion on the 1,000 meters places two fantastic rounds to catch up on the British Elise Christie and the Frenchwoman Tifany Huot-Marchand and flashes from third to the first position. She does not leave that place anymore. Schulting also immediately takes the lead in the general classification. Yara van Kerkhof and Lara van Ruijven finish in the B-final as second and third respectively. Schulting starts at the final of the 1,500 meters. What can the Dutch do? Itzhak de Laat goes down in his 1,500 meter semi-final after a catch-up to the Brit Farrell Treacy. The Dutchman receives a penalty from the referees and is not in the A- or B-final of the miles later today. We still have one distance to go in Collalbo: the 5,000 meter men (European Championship allround). Furthermore, the EC allround for women is over (gold Antoinette de Jong) and the European Championship sprint for the men is ready (gold Verbij). The EC sprint for women continues tomorrow with another 500 meters and 1,000 meters. Daan Breeuwsma and Dylan Hoogerwerf are not in the A-final of the 1,500 meters later today. Breeuwsma ends in a very strong semi-finals fourth and Hoogerwerf was sixth. A spot in the first two is required for qualification for the A-final. Verbij: "I just thought about driving a flat race without risk, I do not know if I could have raced the track record, but I went for the European title, I kept my order, this is a beautiful title that I can take with me. take home and I can be proud of. " Lara van Ruijven does not follow the example of Suzanne Schulting in Dordrecht. The brand new Dutch champion finishes in her semi-final of the 1,500 meters behind the Belgian Hanne Desmet and the Italian Arianna Sighel third and that is not enough for a place in the A-final. Van Ruijven will drive the B-final later today. Kai Verbij takes the European title sprint just like in 2017. The Dutchman will be second in the last 1,000 meters, but he won the first three distances with force majeure. Thomas Krol wins the last 1,000 meters in a track record: 1.08.68. Verbij wins the European title sprint! He extends his title in Collalbo. There is the start! Does Verbij celebrate his European title? It is now time for Verbij! He has a 1.95 second lead on Lorentzen. They ride together in this final stage on the 1,000 meters. We now get the skaters who are competing for the medals. Krol still leads this 1,000 meters. We will also continue with an European Championship in Dordrecht! Suzanne Schulting places himself at the European Championship short track with force majeure for the final of the 1,500 meters. The title favorite shows that she is in top form by going two more rounds outside the Russian Ekaterina Efremenkova and driving far away from the competition. Yara van Kerhof is fourth in the same semi-final and goes to the B-final. For the time being nobody comes to the time of Krol, who by his fall yesterday no longer participates in the classification. In the last stage (stage nine) in action against Lorentzen. Kjeld Nuis does not skate this distance. Track record for Krol! He had nothing more to win, but he scores 1.08.68. We continue with the last distance of the European Championship sprint with the men: the 1,000 meters. Thomas Krol starts and skates alone. Kachanova wins the 1,000 meters, for Leerdam and De Jong. The Neeling ends as sixth. The Dutch women are still the numbers four, five and six of the standings. Kachanova dips just under the time of Leerdam: 1.15.79 (-0.03). The Neeling clocked the sixth time with 1.16.62. Sanneke de Neeling takes on the final stage against the Russian Daria Kachanova. De Jong also wins her ride. She clocks 1.15.88 and beats Fatkoelina (1.16.04). Leerdam now leads De Jong on this 1,000 meters. We continue with Olga Fatkoelina against Letitia de Jong on this 1,000 meters. Leerdam defeats Herzog on the 1,000 meters and is the fastest for the time being: 1.15.82 at 1.16.54. The Dutch skates just no job record, but in the ranking is still behind the Austrian. In the last three journeys, Dutch people always come into action. We start with Jutta Leerdam against Vanessa Herzog, who leads the classification. We continue with the first 1,000 meters with the women. It is the second distance on their European Championship sprint. De Jong: "I've been working on this for a long time, here you dream of being a little girl, and now I've really succeeded, it's getting really hard right now, I'm really happy about it, I really had a lot of nerves. it can be done here is really fantastic, when I came out of the last corner I saw Sáblíková cross the line, then I knew it was okay. " Wüst: "I'm secretly happy that it's over, I think this was the toughest tournament ever, but the attention must go to Antoinette de Jong, who deserves the European champion, I did what I could do, I I have given it a great tribute.I have thought a lot about Pauline from Deutekom.This is the first fourth place in my career that I am proud of.I have to think of myself, that I have I really need it. " And now it's gold for Antoinette de Jong!